UTMAGS Holiday Event: Ugly Holiday Sweaters! 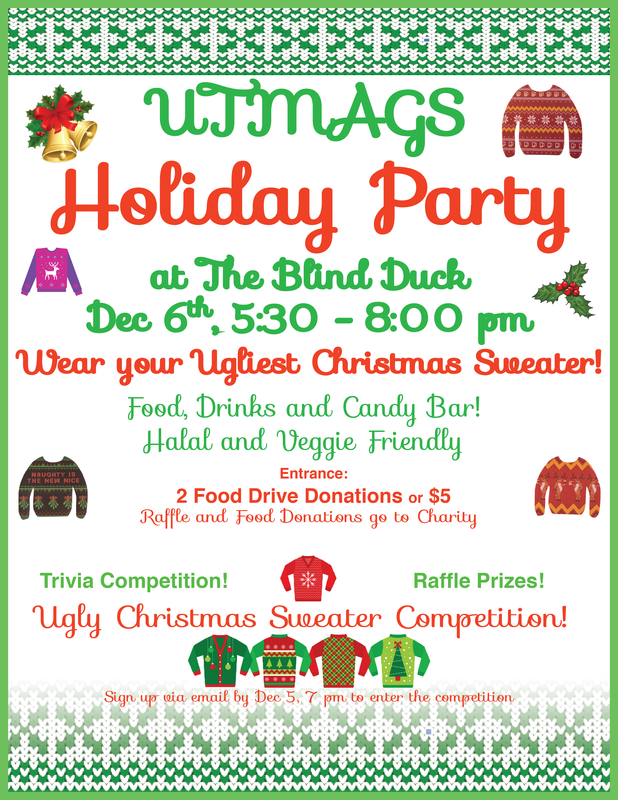 To celebrate this holiday season, UTMAGS is hosting a holiday event! Come by the Blind Duck Pub on Dec 6th from 5:30 to 8:00 pm and bring your ugliest holiday sweater! There will be food (halal and veggie friendly), drinks and candy bars, plus a trivia competition and raffle. Best of all, we are having an ugly sweater competition (see below for details)! Entrance is 2 food drive donations, or $5. Food drive and raffle proceeds will go to charity. To sign up for the ugly sweater competition, email hamna.fayyaz@mail.utoronto.ca with group member names (and graduate departments and she can arrange a time to hand out kits via email). Sign up closes Dec 5 at 7pm. One group member must wear and participate in a small “fashion” show. Audience votes on best sweater a nd the first place team members receive a prize. So come on by for an evening of fun activities, and celebrate the holiday season with your fellow grad students!